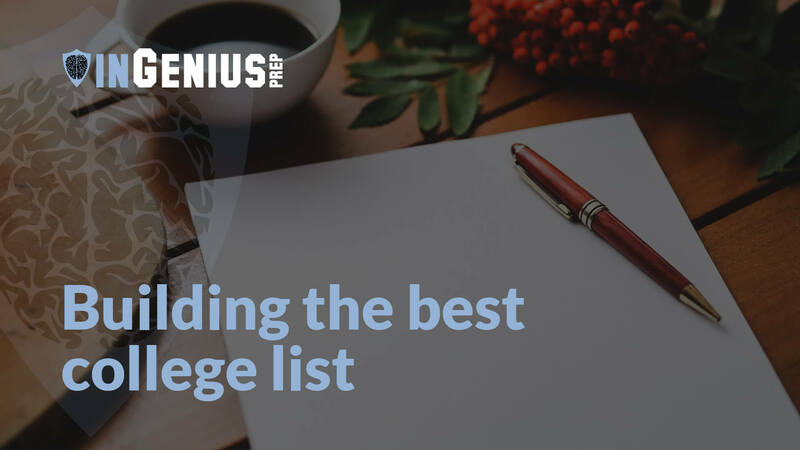 Building a college list list is one of the most important steps in the application process. Too ambitious of a list, and you could end up with very few or no acceptances. Too uninspiring of a list, and you will feel like you did not push yourself or reach your potential. Different students have different paths to building a college list. Some have their minds made up on where to apply before they even enter high school. Others have no idea where to start. Most, however, are somewhere in between. There is never a “too early” to start building a college list. That being said, a good time to get started is during junior year. Starting early will give you ample time to explore, visit campuses during junior year spring break, and change course as necessary. It’s advantageous to give yourself time to properly research and explore university options. What does a good school list even look like? A good school list starts off as a dynamic document. In between the time when you begin your research and when you decide between your acceptance offers, you will add and delete many different schools to your list. You should start off by building a preliminary list, which can be as long as you want. You should use this list to explore different schools, record your research, classify them, and ultimately decide if you are interested in applying. Your finalized list will be the list of all of the schools you decide to apply to. Usually, it will include somewhere between 7 and 20 schools. A good finalized list will include at least 30% “safety” schools and at least 40% “fit” schools, and fit your larger ambitions and goals in terms of the kind of schools you want to attend. How do you categorize school types? How many schools should be on your list? What determines how many schools to include as you’re building a college list? A lot of things. Ultimately, the number of schools depends on the student. But in most cases, we recommend applying to about 10 schools. What are your geographical preferences? What are you career ambitions? What are your academic interests, strengths and weaknesses? What kind of school will you thrive in? Big or small? Public or private? Rural or urban? Party or brainy? What kind of school will give you what you need (or, put more subtly, what you actually want instead of what you think you want)? Where will you succeed, academically, socially, personally, professionally? Where will you actually get in? This self-evaluation is ongoing. You may think you want a school in an urban setting only to change your mind when you visit the campus. That is what makes the school search exciting! Your network is also another great resource. Your parents, friends, and teachers will have working knowledge of schools, and also of you! Don’t be afraid to start the conversation with them. As you get exposure, you will begin to get a sense of what is important to you and what kind of information you need to help you assess a given college. It is very easy to get overwhelmed by too much information as you're building a college list! When creating your preliminary school list, keep your notes simple. Starting off by looking through the rankings is a good way to gauge your chances of getting in. But, most rankings methodologies are imperfect, and it is best to choose schools that fit your individual wants and needs. If you are considering a school, keep a list of pros and cons. If there are too many cons or not enough pros, nix it. All things being equal, you want to apply to as many schools as you’d want to attend if given the opportunity. But you have to balance that by the limited amount of time you have necessary to apply, your chances of getting in, and the cost of multiple application fees. That is the closest you get to a formula. It is especially hard to gauge because, in most instances, you have never applied to college and don’t really know what it takes. After all, everyone underestimates how much time and energy it takes to apply well to a university!